The MP Series High Static Pressure fans are that can produces high static air pressure allowing for a direct and focused airflow making them ideal for the densely packed fins of a radiator. More links for "PH-F140MP PWM 140mm Fan"
I bought these fans to replace the stock Corsair fans which came with the H110i. They are absolutely fantastic, I run them between 800 RPM and 1100 RPM and they are whisper quiet. 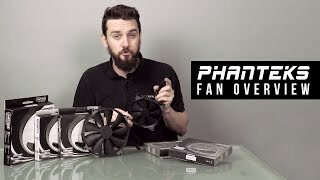 If you are looking to replace stock radiator fans or even your case fans I would highly recommend these. I changed the stock fan on my Kraken X41 for one of these, put the profile to performance and its still as cool but quieter. Well worth the money. Got it delivered by Overclockers very promptly and free sweets, nice! Ordered these fans to change from the stock fans on my Corsair H105. I've noticed not many people have reviewed them after trying to find peoples views on the interwebz, so I took the plunge to buy these and because I have the Phantek Primo case I love how quiet the case fans are so decided to give these static fans a go. So far from initial tests the ambient temps of with the fans are running at 40%/600 RPM is 20c. If I run them at 80%/1250 RPM the CPU temp is pushed under 17/18c at ambient and theres barely any noise increase, running them at 100%/1650 RPM the temps dont get any lower, but the noise is audible and its mainly the air movement I can hear. Overall they are a far quieter fan than Corsairs stock fans for the H105, even at 100% they dont get near as loud as the stock fans, will post an update on temps under load when I get the chance.